Somewhere on the scale between the husky purity of a young Joni Mitchell and Jacqui McShee’s ethereal clarity comes the voice of Yorkshirewoman Rosie Doonan, insightful and humane, restlessly exploring the vagaries of human relationships through lyrics that are as articulate as they are personal. Doonan’s new album, Pot of Gold, is like a series of encounters with characters and experiences that always leave their mark – more often the bruise of an emotional clout than the ghost of a lingering kiss, but always provocative and empathetic. From the deceptively upbeat, guitar-driven urgency of “Fall For Me” to the ominous, on-the-edge strumming of “Darker Side of You”, Doonan presents a warts-and-all yet compassionate vision of the relentless cycle of meetings, fallings and break-ups that constitute life. The single “Lay Your Love” epitomises Doonan’s realistic attitude and intelligence as a lyricist. It might be a break-up song, but the back story isn’t all bad and the relationship is meaningful enough to deserve one last send-off. Lines are drawn in the sand, experiences noted and assimilated, hindsight acknowledged, inevitabilities accepted and understood (“Into the Fire”). These are folk tales, full of complex musical influences that hint at Doonan’s personal heritage (her father was a uilean piper with Hedgehog Pie) – “Wind That Shakes the Barley”, with its yearning strings, slow marching drums and harmonica, is the most traditional song on the album – while embracing a host of other styles and techniques. “Victor”, for example, comes on like a sentimental Edwardian parlour song with modern nuances. “Winter Song”, reminiscent of a top quality Judie Tzuke number, is a touching, delicate paean to the comfort of turning back to a love that, despite everything, is still all that matters on a cold, snowy night. “Lady Blue” might be a tribute to Joni Mitchell herself, while the album’s title track has a winning jaunty gait and energy that is equal to anything that’s come so far from the pen of Amy McDonald. 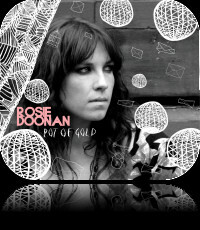 Female singer/songwriters are hot currency at the moment and with this album, her second as a solo artist, Doonan has well and truly staked her claim to a place among the front-runners. Rosie Doonan is on tour in March at the following venues: 11th – with the Snap Dragons at Wem Town Hall (Shropshire); 12th – with the Snap Dragons at The Brindley, Runcorn; 17th – with the Snap Dragons at Cumberland Arms, Newcastle-upon-Tyne; 19th – Shaw Theatre, Leeds; 20th – The Boardwalk, Sheffield; 23rd – with the Snap Dragons at The Biddulph Arms, Stoke-on-Trent; 25th – Trowbridge Arc Theatre (Shropshire); 26th – with the Snap Dragons at The Beehive, Swindon.